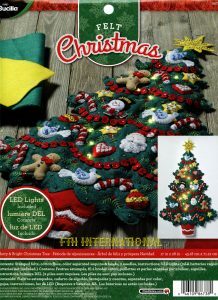 Merry & Bright Christmas Tree Bucilla Felt Wall Hanging Kit # 86738, Real LED Lights - FTH International Sales Ltd. The bright decorations highlighted with glistening sequins and beads will make this a stunning addition to your holiday decor but Bucilla didn’t stop there. 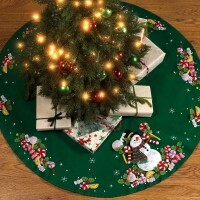 This is one of the first kits in several years that includes real lights in the kit that will allow you to make this tree as close to your real tree as possible with a string of shining little LED lights that just require the flip of a switch to add even more sparkle and shine. 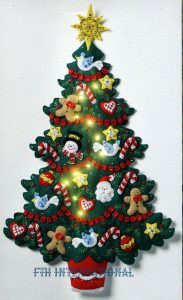 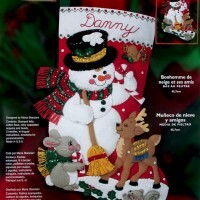 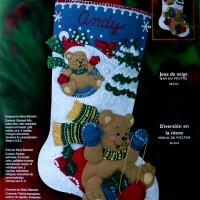 When finished, this Merry & Bright Christmas Tree Wall Hanging will measure approximately 17″ wide by 28″ high.